Fill 'Er Up! Up! Up! It’s like a miracle. All of a sudden, the tundra is bright green, dotted with tiny flowers. Songbirds are everywhere, returning from their winter quarters in Mexico, South America and the South Pacific. Our summers are brief and cool, but we welcome them especially, knowing that we will see frost again next month. You remain in our prayers, and we sincerely thank you for your financial help and your prayers on our behalf. Thank you! REUNITED (left): Tom and Florence Busch rejoin following graduation ceremonies at Boston College, with Tom’s honorary doctorate tucked under his arm. Soon afterward, B.C. treated thirty KNOM contributors and former volunteers to a delightful luncheon. See page 4 for more photos and information. NO BREATHING EASIER: Last month, the KNOM news department reported the results of a recent medical study. According to the research, no fewer than forty percent of children in the KNOM listening area suffer from chronic respiratory disease. In larger communities like Nome, population 3,500, the problem is typically asthma. In villages, it’s chronic cough of undetermined origin. INSPIRATIONAL SPOT: I have a great need for my Lord. I have a great Lord for my need. “THE LORD BE WITH YOU” (left): In one of his village parishes, Fr. 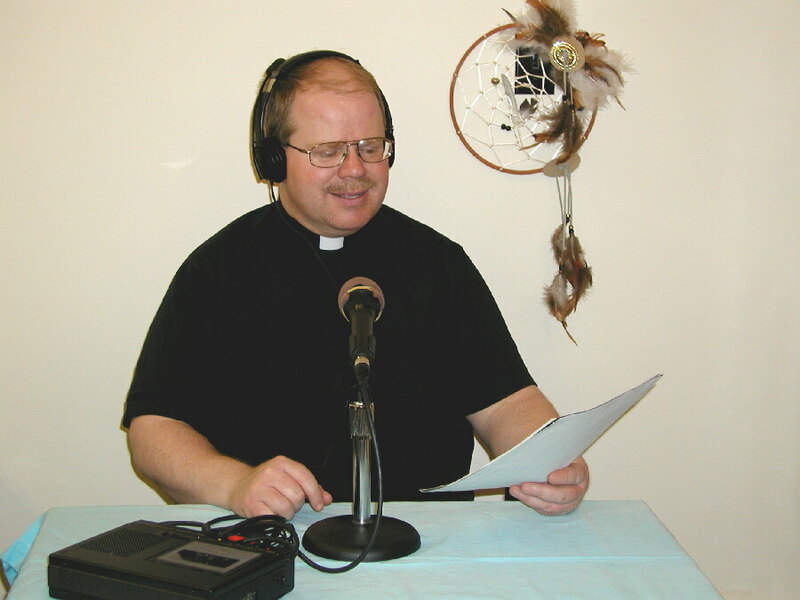 Paul Cochran, SJ records this popular weekly radio program. In each ten-minute show, Father Paul relates the following week’s scriptural readings to Eskimo life. His gentle, easygoing manner makes for an enjoyable and highly listenable program. “The Lord Be With You” is in its fifteenth year on KNOM. It began in 1990, when Bishop Mike Kaniecki, SJ asked fellow Jesuit Fr. Chuck Peterson to produce the weekly homilies. They are intended to help Native deacons preach in parishes that are without a priest. 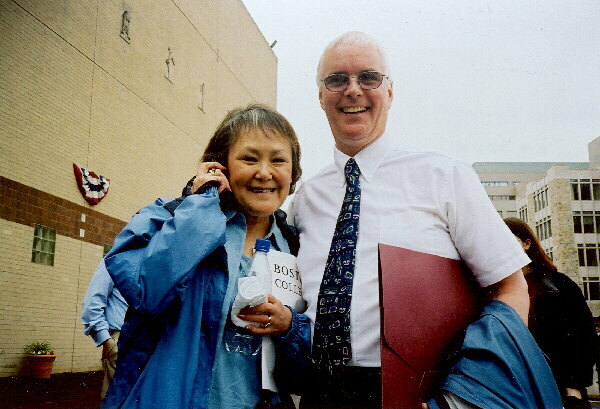 When Father Chuck left Alaska in 1997, the program passed to a former Jesuit Volunteer, Pat Tam, who lives in the village of Emmonak (e-MAHNG-ek). Father Paul picked up the program in 2001. In addition, Father Paul ministers to the villages of Newtok and Chefornak (cheh-FOR-nuk), both of which are slated to receive KNOM translators. FILL ‘ER UP! UP! UP! With the first tanker shipment in June, Nome’s gasoline prices rose over a dollar, to $3.50 a gallon. Fuel oil, the town’s primary source of heat, skyrocketed, too. We don’t know what the final consumer price will be, but the wholesale price in quantities of 3,000 gallons or more just catapulted up to $2.24 a gallon. In many of the small villages we serve, gasoline has risen above $5.00 a gallon. OOPS: Due to an error by Nome’s Internet provider, many Nome e-mail addresses, including most of KNOM’s disappeared for over a day June 7th and 8th. If you e-mailed KNOM those days and received no response, please try again! WELL TREATED: Important local issues treated on recent KNOM programs include foster care, rural Alaska jails, western Alaska transportation, air safety, emergency medical services, arctic survival, domestic violence, breast cancer, hepatitis C, domestic violence and drunk driving. Other interview programs dealt with interesting topics like gold mining, polar bears and Siberian archaeology, among others. Thank you for making all of our work possible. The oldest Catholic radio station in the United States, alive and strong � thanks to you. INSPIRATIONAL SPOT: God is like air. You can’t always see it, but you cannot live without it. WHAT’S THAT CONTRAPTION? : KNOM assistant program director Kelly Brabec demonstrated something which most of the visiting children from the village of White Mountain have never seen: a turntable and a vinyl LP record album. The kids asked to hear the song “Hound Dog” by Elvis Presley. HOT! BUT NOT FOR LONG: June 7th, Nome reached +83�, the warmest temperature ever recorded for the month of June, and the hottest Nome day in eleven years. People shut off furnaces, opened all their windows, turned on fans, and went to bed without covers or sheets. In the middle of the night came the cry “alapah!” (ah-lah-PAH), the Eskimo exclamation for “it’s freezing!” Windows closed, fans were turned off, furnaces switched back on. The temperature had dropped over forty degrees. Nome was back to normal. AND THEN…three days later, Nome had a one-hour thunderstorm, which took everyone, including the National Weather Service by surprise. We experienced our first lightning in four years, and only the seventh thunderstorm in the past ten years. HAPPY BIRTHDAY to KNOM! On July 14th, the mission plans to quietly celebrate its 33rd anniversary on the air. Thank you for making our continuing work possible. ART SCENE: In early June, the Coast Guard was called to fly over the Bering Strait, where it was reported that a sailboat was stuck in shifting ice floes with no sign of life. Rescuers shook their heads to discover a welded thirty-foot triangular work of art stuffed with discarded Christmas trees. The artwork had been built on top of the ice at Nome by an eccentric local sculptor and when the ocean ice broke up, it drifted off to sea, negotiating its way 170 miles northwest. Please consider adding missions like KNOM to your will. We consider such gifts sacred, and carefully place all bequests into accounts that are only used for future major improvements, and for emergencies. INSPIRATIONAL SPOT: The carpenter’s Son had hands that were callused and worn. These hands held sacred scriptures in the temple, hammered wood in the workshop and carried wood for His mother. Ordinary, everyday things for extraordinary hands. Jesus, Carpenter from Nazareth, may the work of my ordinary hands help to sanctify me. INSPIRATIONAL SPOT: If you always tell the truth, you don’t have to remember anything! 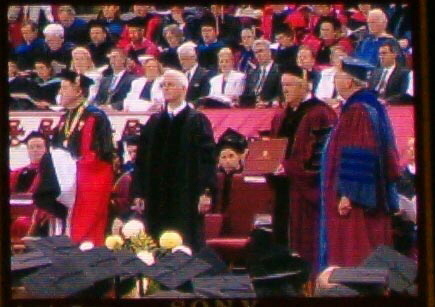 In the first image, KNOM general manager Tom Busch stands as his citation is read at the Boston College graduation. 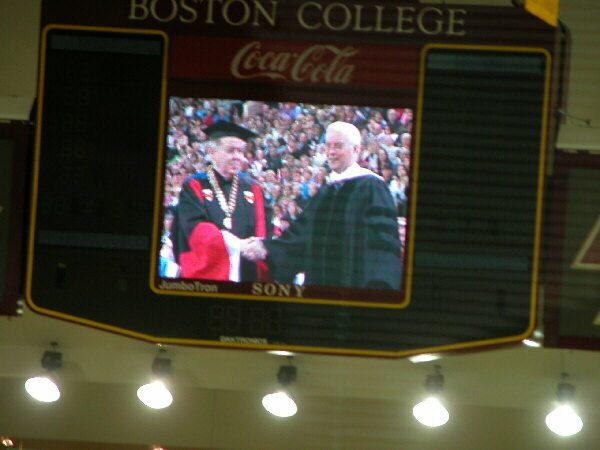 In the second, Boston College president Fr. 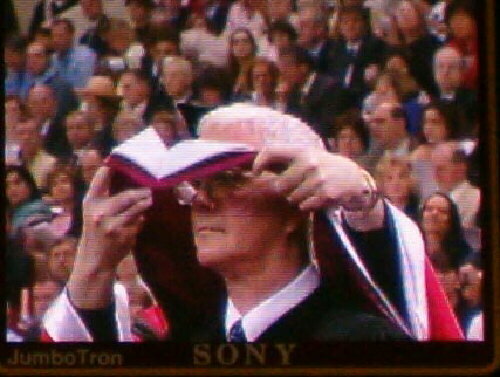 William Leahy, SJ places the academic hood for Doctor of Humane Letters over Tom’s head. In the third image, Father Leahy congratulates Tom. These picture are from one of the large video monitors above the stage in Conte Forum. 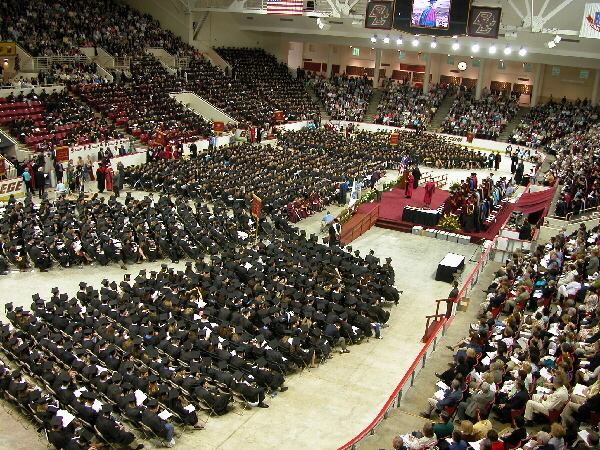 Commencement was moved to inside the university’s sports arena due to threatening thunderstorms. (Below, left) Tom was seated in the front row on the stage, toward the right center of this image. Luncheon was a high point, Tom says. “We were thrilled to meet so many wonderful KNOM supporters. THIRTY YEARS AGO: On July 14, 1974, KNOM celebrated its third birthday by stretching the station’s time on the air from 16 to 18 hours a day. Again, we thank you for your great kindness to the remote people whom we serve. Throughout 100,000 square miles, thousands of isolated Alaskan villagers depend on our signal every day, for inspiration, for news of the outside world, for positive entertainment and for companionship. We pray that Our Lord will reward you a thousand fold. May He greatly bless you!